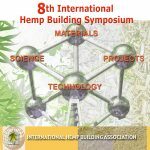 Register here for the 8th International Hemp Building Symposium event on the 16th and 17th October 2018 held in an old castle Hof Ter Loonst, Kapenhout, Brussels, Belgium. IHBA members can avail of membership discount. Fee to attend the 8th International Hemp Building Symposium 16 & 17 October 2018, this also includes refreshment breaks, two buffet lunches, the symposium evening meal on Tuesday 16th October and transport from the Symposium to the hemp building project site visit and demonstrations. 20% discount - single fee to attend the 8th International Hemp Building Symposium 16 & 17 October 2018, this also includes refreshment breaks, two buffet lunches, the symposium evening meal on Tuesday 16th October and transport from the Symposium to the hemp building project site visit and demonstrations. This fee includes attendance for the two day Symposium 16th and 17th October, hemp tour, tea breaks, two lunches, evening meal on the 16th. Payment options are by Credit Card, PayPal, Bank Account Transfer EFT (contact us) or by Cheque. Payment is in Euro(€) currency. Please make sure to book and pay for your hotel separately.